Hip Hops: This Is A Joke Right? Is this an NBA mandated thing to get everyone to the voting site? Doubtful. Looks like he just thinks he should be going to the All-Star game. I mean why not, his team has won 0 games and he averaged a whopping 12 points per game! But Shaq and Barkley keep talking about him so he must be an all star right! His numbers are slightly better than Brendan Haywood's numbers were, and Haywood was the 4th best player on a 5-8 seed team. Four players made the ballot. Was the person fired? Andray Blatche? Nick Young? Why not throw Jordan Crawford on there too! I know I'm writing in Rashard Lewis. 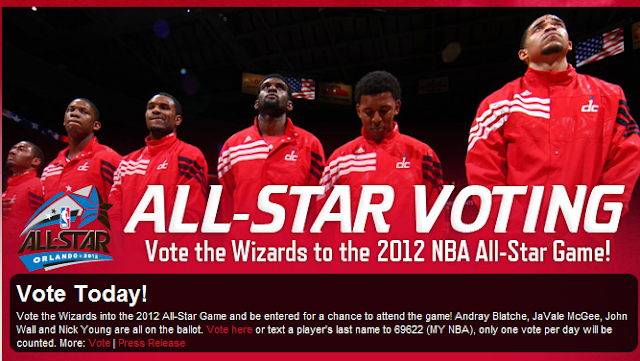 And yes JaVale & the web site, thank you for reminding me to go vote for the all star game. I won't be selecting a single Wizards player, and especially not you. I will be not voting for you guys in all 16 languages on all the platforms the NBA has set up. This team hurts to watch. I feel bad for Wall. We gotta win a game sooner or later by accident right?